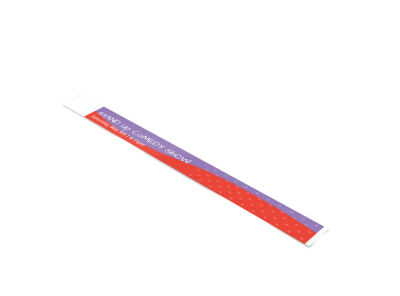 Track attendance at your next creative event with customized wristbands. Comedy shows, open-mike nights, talent shows, and even performance art exhibitions can all benefit from a smartly-designed wristband as part of the event’s attire. Choose one of our professionally-designed templates, then take advantage of all the tools available to you in our online editor to make our design your own. Your exhibition will knock it out of the park – design yours now, then print the finished product yourself or send it our way for a delivered-straight-to-you print job that you will be proud to show off!